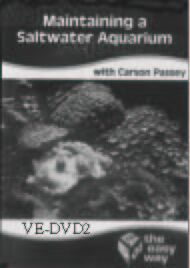 Advanced companion video to the DVD titled Starting a Saltwater Aquarium (VE-DVD3). Helps aquarist to effectively and effeciently maintain a healthy and thriving saltwater aquarium. This DVD outlines and advocates consistent maintenance schedules, including: daily, weekly, monthly, and every once in awhile maintenance. Host shares tips and tricks that make water changes a snap, demonstrates helpful equipment, and much more. Many reef keepers can spend years learning the important principles that this DVD gives in a clear and straight forward approach to help you avoid mistakes and major setbacks.